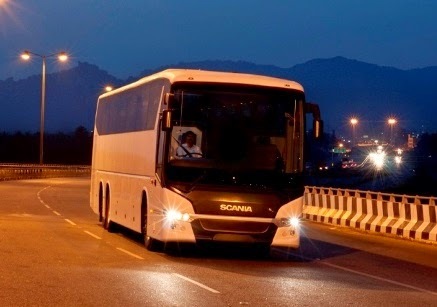 Scania’s latest inter-city luxury bus in the multi-axle (6×2) segment is here in India, to hit on the popular Volvo 9400 coaches. That’s something isn’t it?? Oh yeah, Scania is here in India. The company commenced the production of its P410 trucks as CKD in June last year from its Narasapura plant in Karnataka. All other Indian lineup comprising mining and on-road trucks with its Metrolink Luxury Bus was showcased in the 2014 Delhi Auto Expo. Deliveries of the Metrolink coaches have already begun. 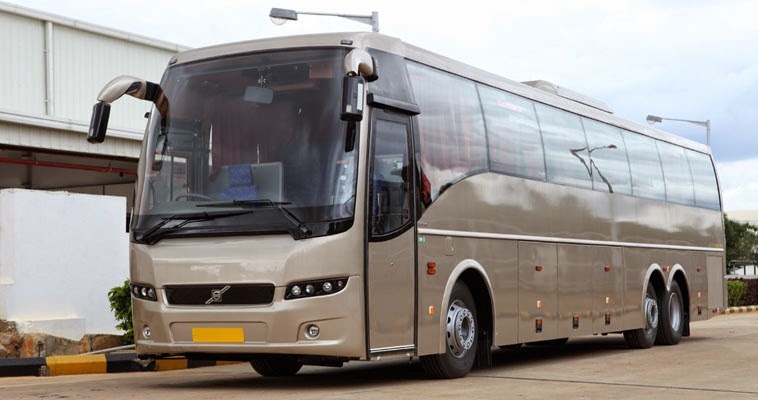 The Inter-city luxury bus segment in India is long-dominated and completely monopolised by Volvo for more than a decade. Volvo entered the market in 2001 to mark the beginning of a new era -with true bus chassis concept, low floor city buses, multi-axle coaches, and host of comfort and safety. There was hardly a direct substitute for its likeness, but Indian buses with the expertise of local bus body builders have flared so well that costly Volvo could hardly penetrate beyond the periphery of the market. Mercedes Benz does offer series of luxury intercity buses in the single rear axle (4×2) configuration, as does Isuzu Motors, but both are comparatively new to the market and are gradually gaining momentum. At least in the past few years, escalating market standards and consumer requirements have resulted in more takers for Volvo buses. Scania Metrolink HD 14.5 metre Multiaxle Coach. Note the effect of Tag Axle at the rear. Now Scania is here to test the sector. The Volvo 9400 finally gets a strong rival. In fact, the Metrolink is the only rival to the 9400 in the 14-metre, multi-axle (6×2) segment in India. 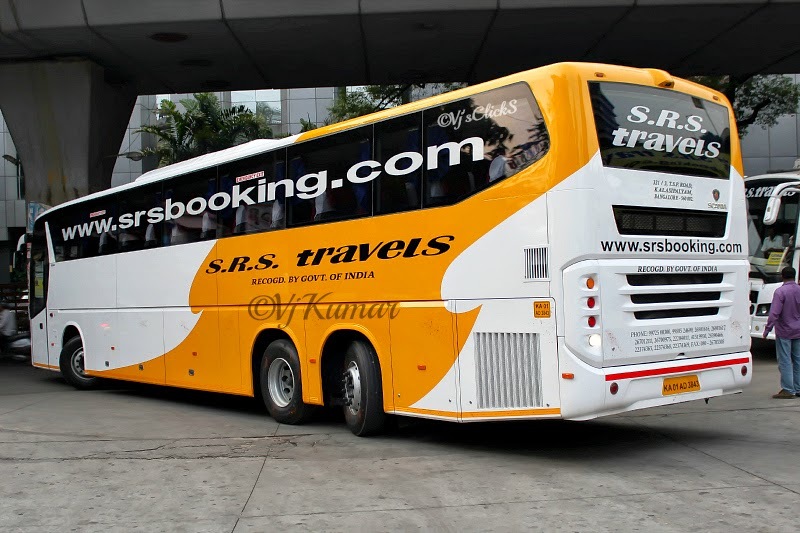 The coaches are assembled from CKD units with localisation of 30% initially. Let us explore both of them in detail. The Metrolink coaches are powered by Scania’s 13-litre 6-cylinders turbo-charged DC 13 diesel engine, producing a max power of 410 bhp @ 1900 rpm and max torque of 2000 Nm @ 1000-1350 rpm. The engine is coupled with an 8-speed automated-manual gearbox with ‘Opticruise’ gear shift program, along with a build-in retarder and an inter-cooler. It is Euro-III compliant and is capable of running in Ethanol ED95 fuel configuration i.e a fuel mixture of 95% ethanol and 5% ignition improver (often used in modified diesel engines). In fact, the company claims that its entire engine lineup is compatible with ethanol and bio-diesel. Scania has also started trial runs of Ethanol powered city buses at the city of Nagpur. While the Volvo 9400 has in its rear a comparably smaller 9-litre 6-cylinders D9B diesel motor that is turbo-charged and Intercooled, with a build in retarder. The max output values are 340 bhp of power and 1600 Nm of torque. It comes with a 6-speed mannual, fully synchronised gearbox, and is Euro-III compliant. It is to be noted that Volvo has not updated its engine offering for a fairly long time owing to its monopoly and high sales. 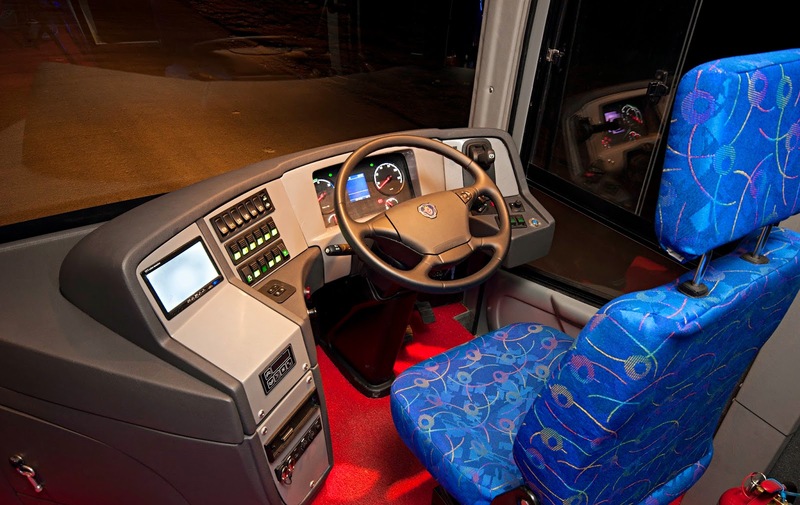 The hydraulic power assisted steering system with a circulating ball-and-nut type steering gear enables small turning circle (considering its length) for both the buses. The 9400 has a turning radius of 10.5 metres while the Metrolink has a little larger radius at 12.5 metres. Ground clearance for both the coaches is 270 mm. Pneumatic (Compressed Air) suspension is a standard features in all wheels with almost same configuration in both 9400 and Metrolink. The Metrolink has a speed limiter at 90 kmph, while the Volvo can touch a top speed of 100 kmph. Sophisticated suspension system with multi-axle configuration lends a balanced center-of-gravity and superior high speed stability for the buses. This class of luxury coaches are loaded with safety features, which are desperately absent in every others buses on our roads. Of course you pay too much for these luxury liners, but considering the instances of highway accidents by intercity buses and their massive death tolls, we have to understand its importance. Because every buses carry almost same amount of passengers, and even our modern low-cost Tata and AL buses are capable of reaching a max speed of 100 kmph on open highways. So vulnerability is indeed the same for every intercity buses. Both the Metrolink and the Volvo 9400 enjoy disc brakes in all wheels, ABS and Electronic Braking System, Electronic Stability Programme, Hill Hold, and seat belts. In addition, the Metrolink gets Traction Control, retarder (manual/ automatic control), automatic exhaust braking system, and reversing camera. Since both the coaches are built on a strong frame upon ladder-frame chassis, roll-over protection is much better than a typical custom-built coaches. Radial tube-less tyres in both the coaches ensure better road grip and stability. Unlike cars, these coaches comes with variety of optional packages. Buyers can choose among accessories like curtains on windows, reading lights, gangway lights, LED Screens, DVD player, Radio/USB, Speakers with sub-woofers, Refrigerator, Lavatory in both the models. Air conditioning is standard on both the coaches. While the Metrolink also comes with LCD screen options in front and middle, along with the Scania Fleet Management system. Don’t ask me Scania or Volvo. It isn’t that simple to answer. But the whole point is that we have got a new liner in the segment, the only rival to the dominant Volvo 9400 buses. That’s a notable development in the Indian bus market. boxy and tall, there is no big deal here! But I like the use of black tone in the face and the panels of the Metrolink. The rear design is also little different. I’m bored of Volvo’s looks, so why not consider newbie?? Next, would you like to read more on Scania, Volvo, Buses, or Commercial Vehicles ?? Such attractive designs, feel like travelling just for the heck of it. Volvos and Scanias might come and go. But it Gotta be Mercedes, the king of roads!! Thank you Sudeesh Nair for pointing out. That was a silly mistake on my part. I’m sorry! Thank you Sudeesh Nair for pointing out. That was a silly mistake on my part. I'm sorry! I have traveled on Volvo on a long distance about 1000 KMS at a stretch and it feels like nothing. when is bharatbenz multi-axle bus to be launched? Scania Bus Are Dull In Acceleration.Althrough Volvo I-Shift Automatic Get’s Too Early.In Safety Concern Both Have Same Fire Exhaust,Tuff In Glass.And Volvo Is Used Over A Decade By All Vendors.And In 2007-11 Merc Came But Hardly Some Of The Exist.Many People Think Scania Will Rule.But Volvo Is Volvo..
Volvo I-Shift Auto gearboxes are not offered in the 9400 bus range. Kallada B11R Has I Shift GearBox,And Its 9400…Strange! !..